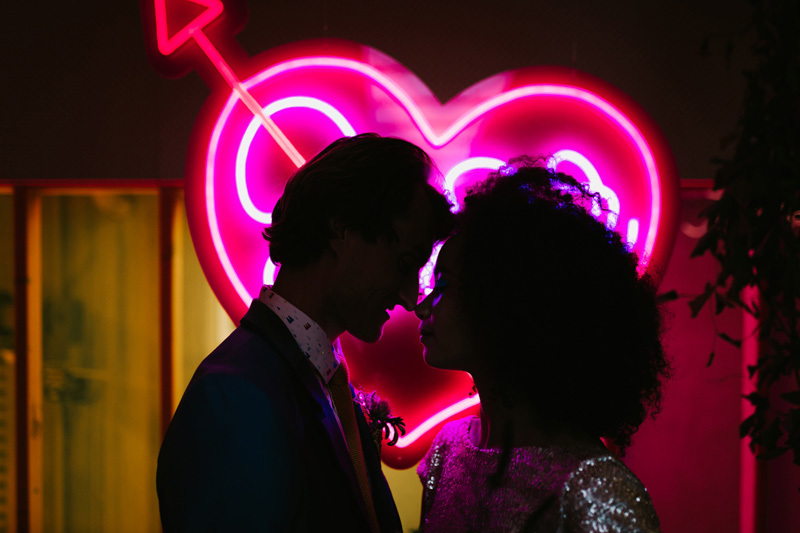 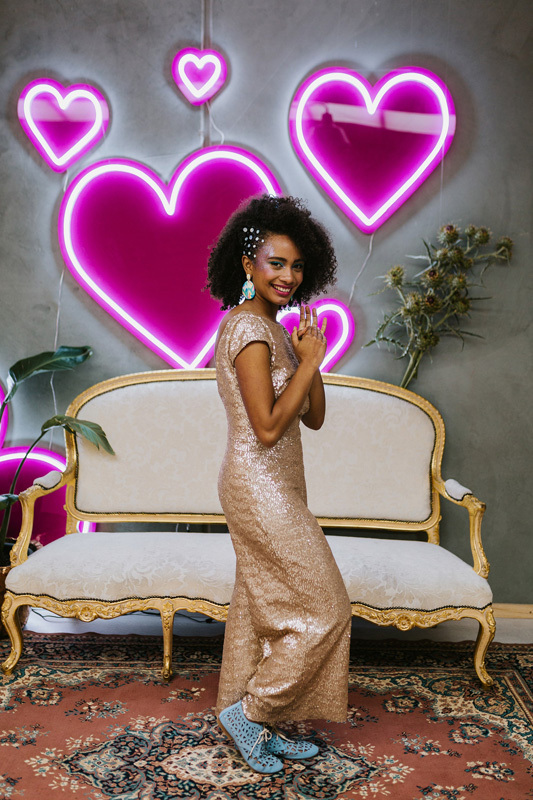 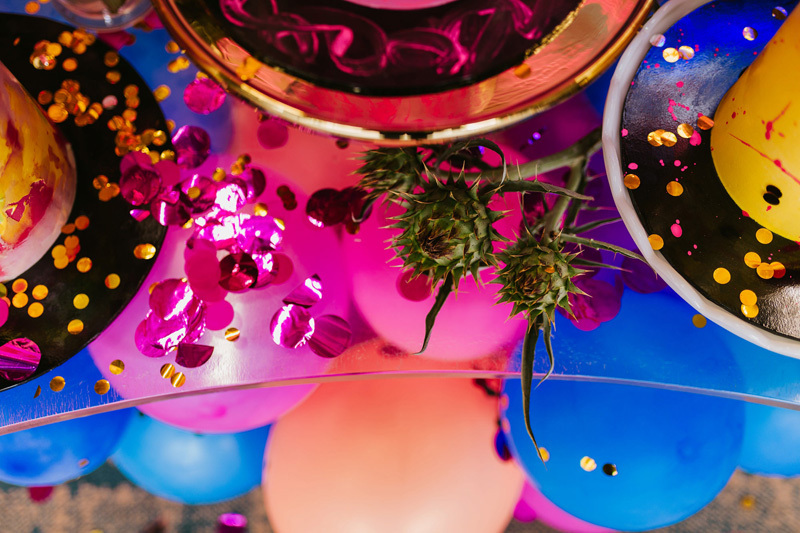 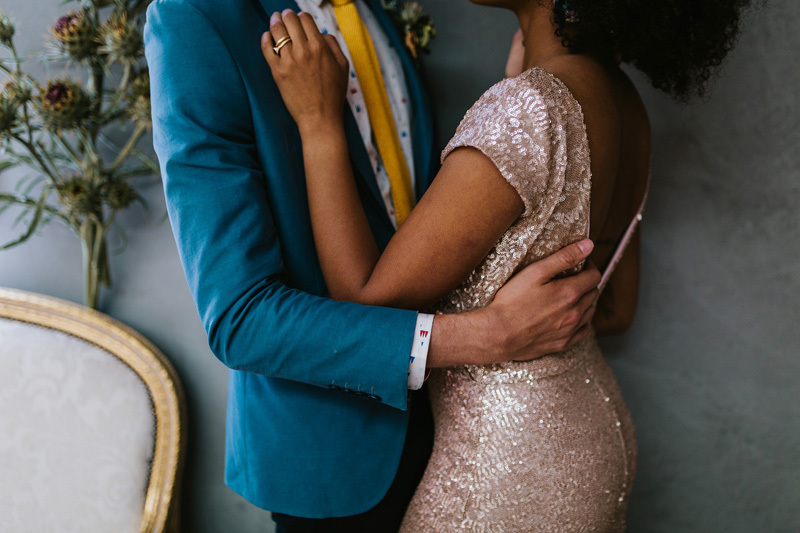 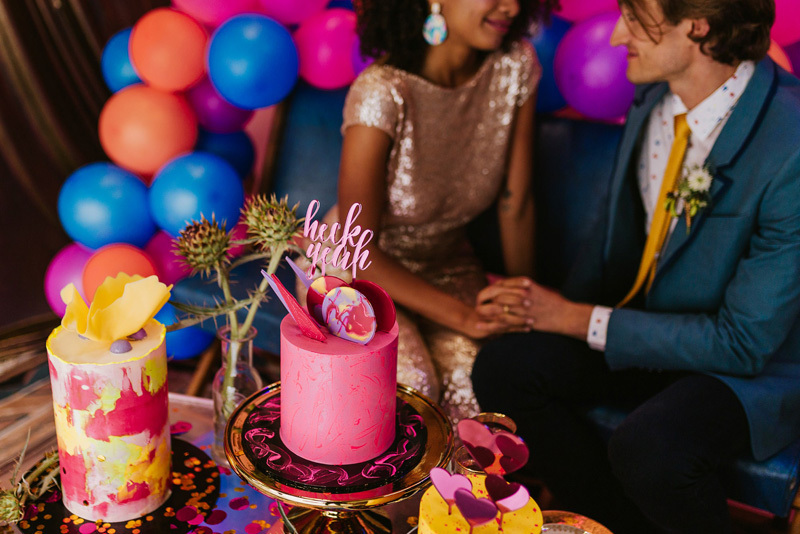 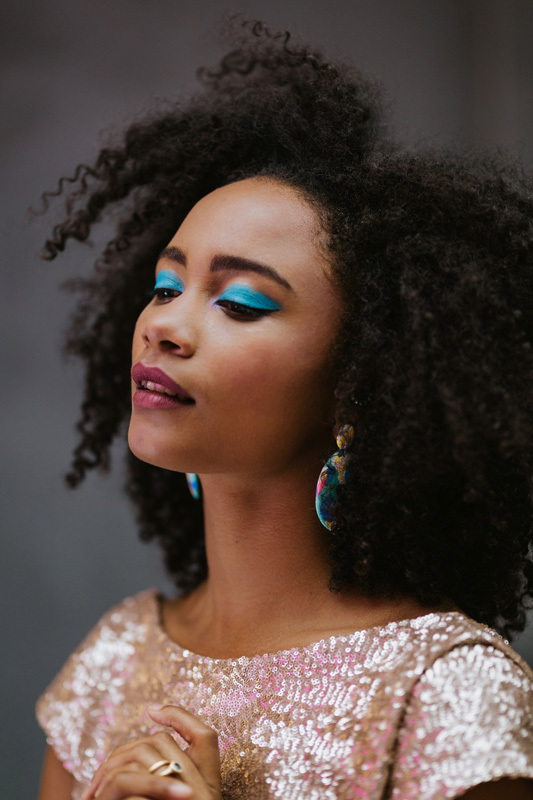 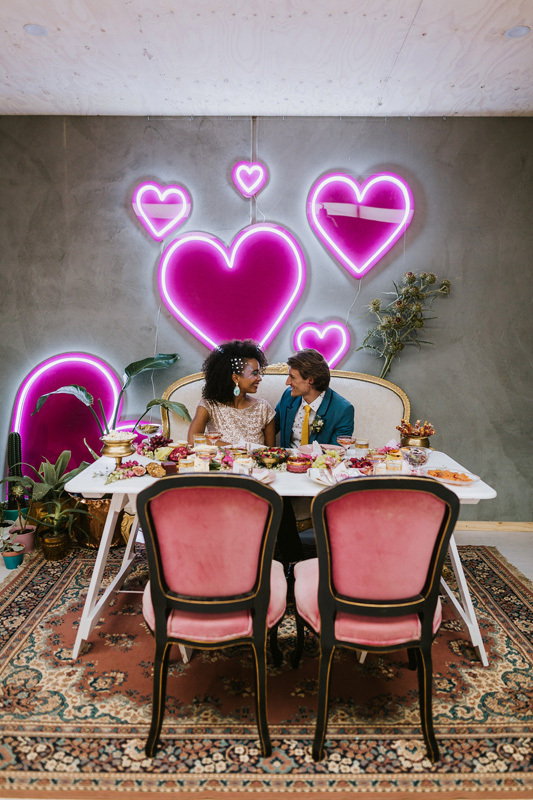 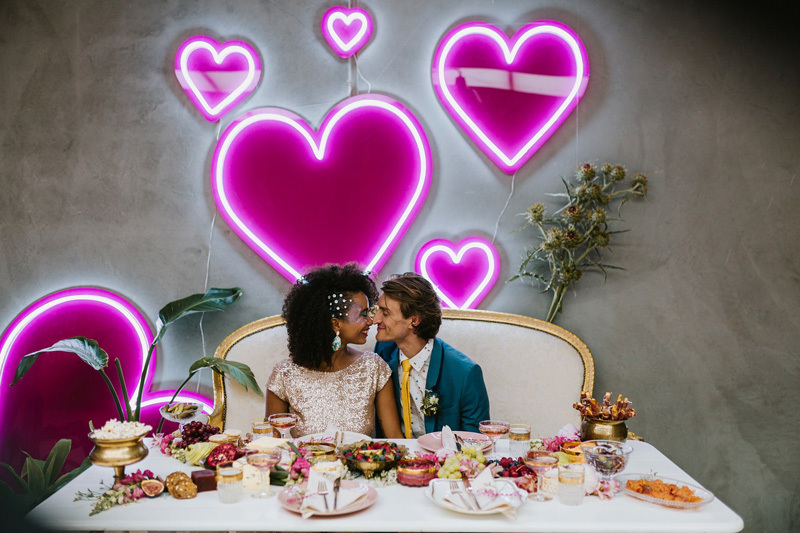 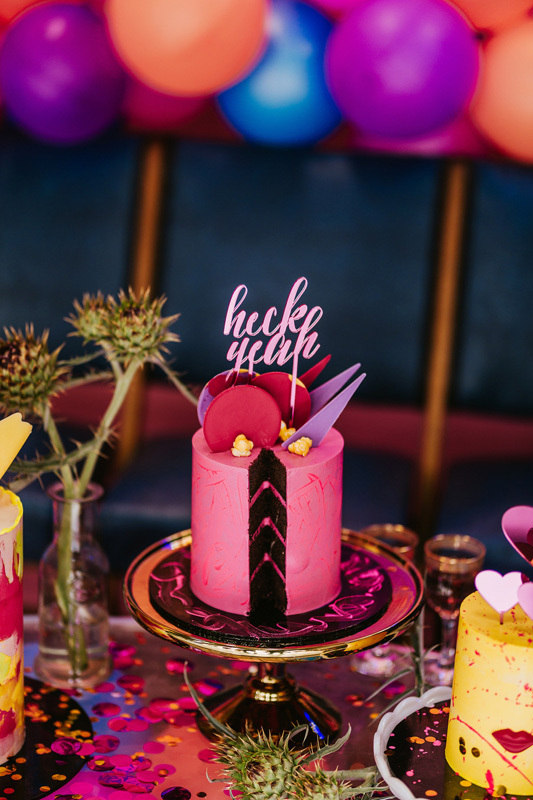 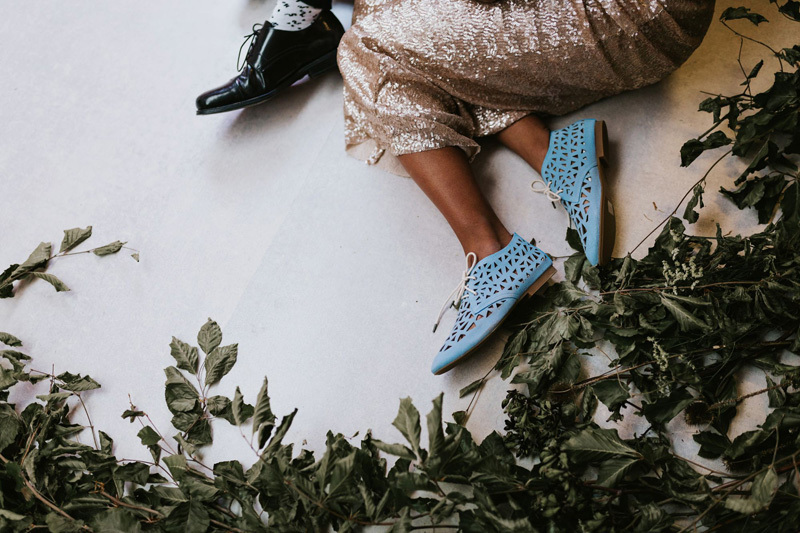 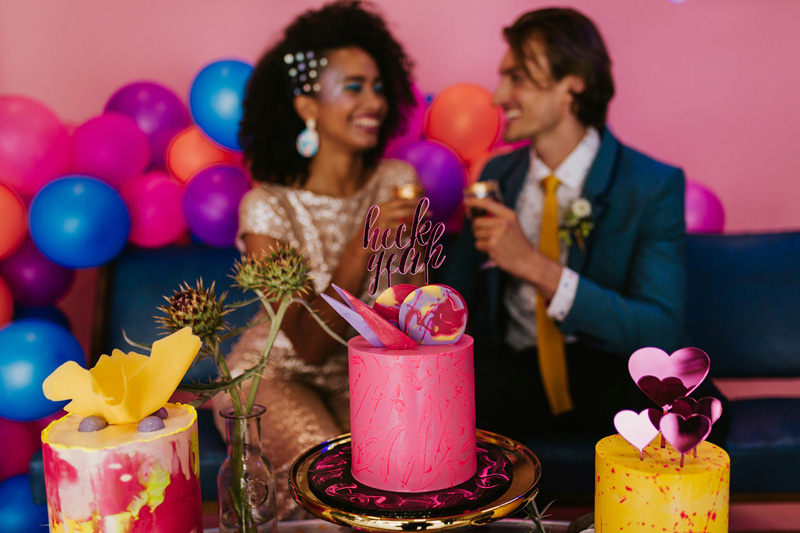 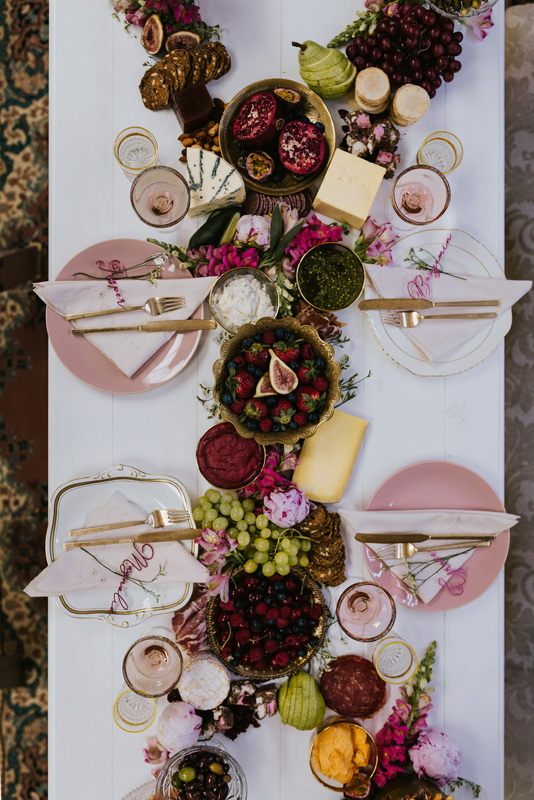 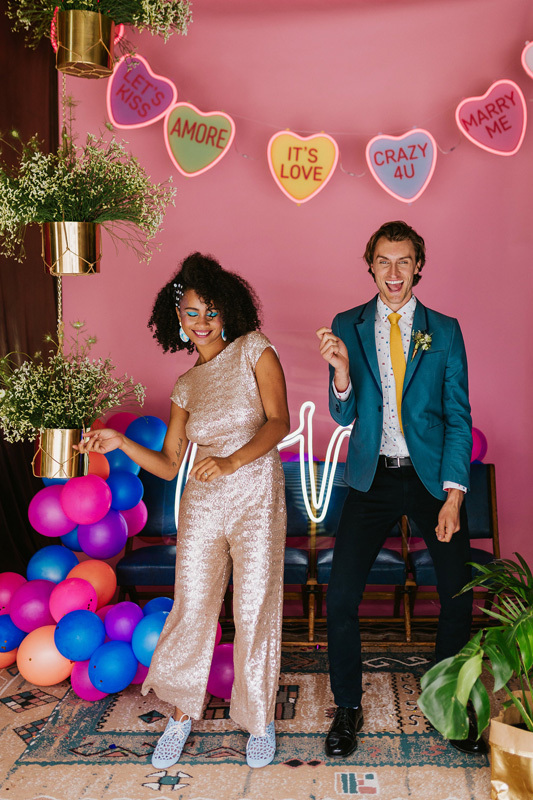 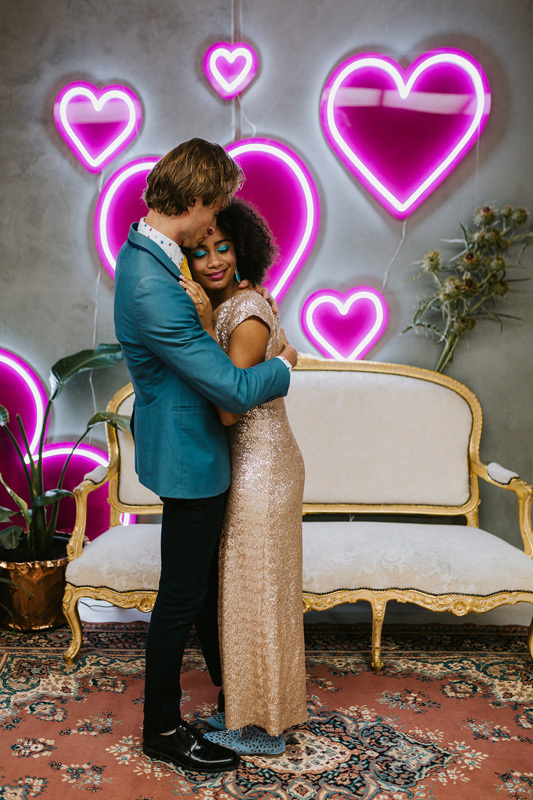 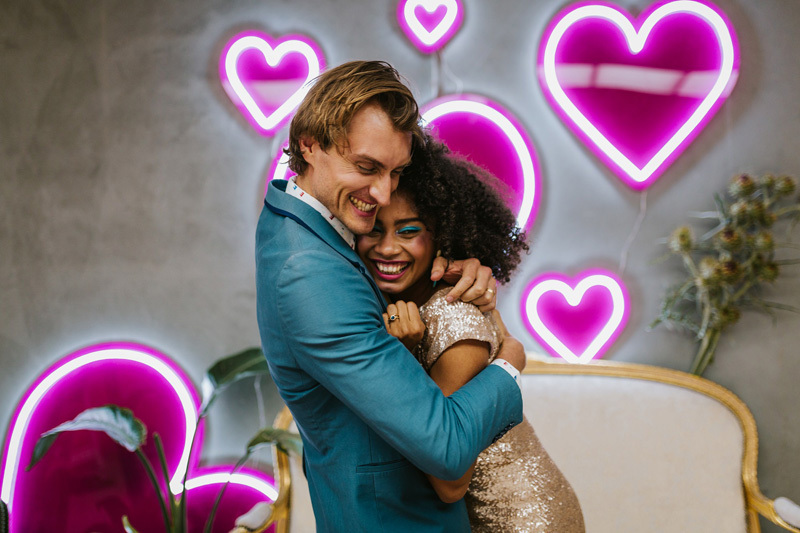 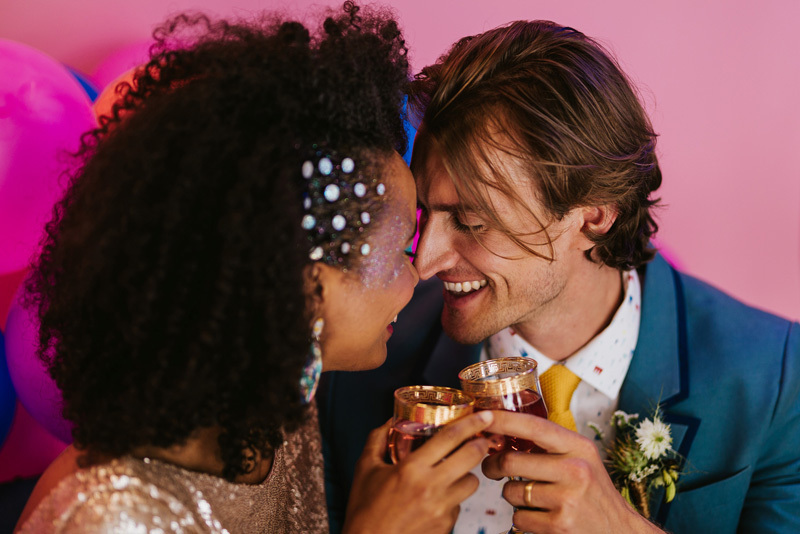 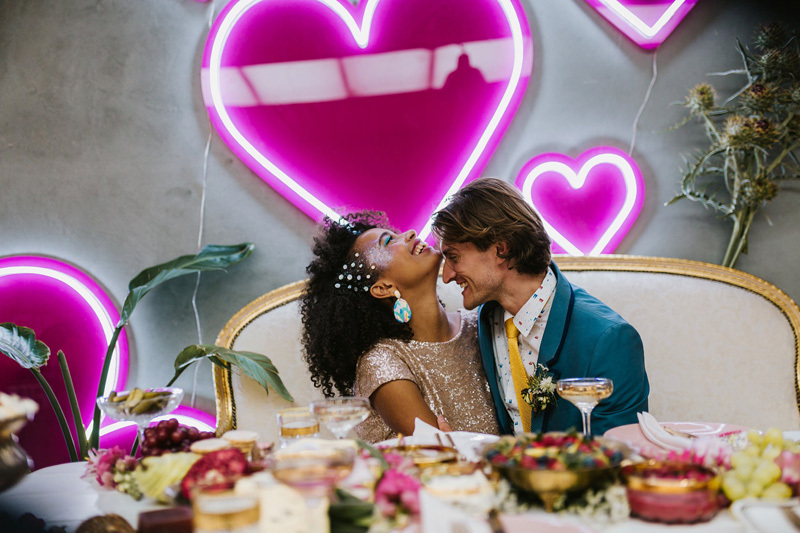 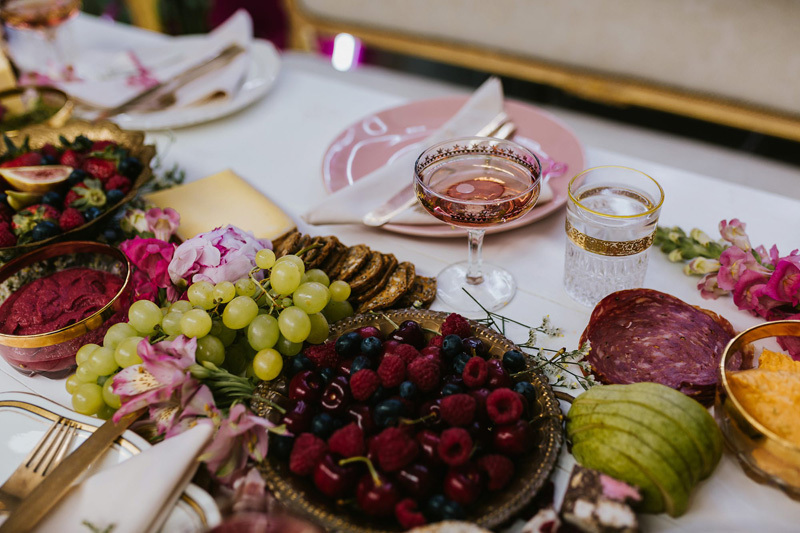 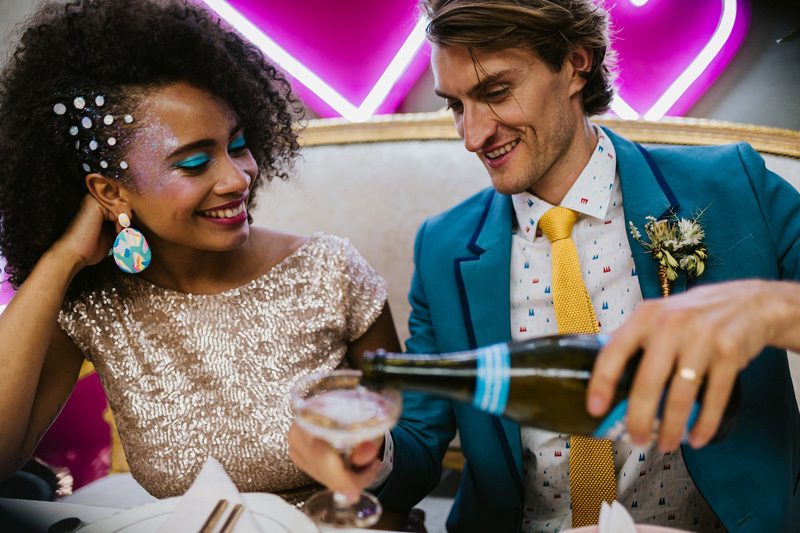 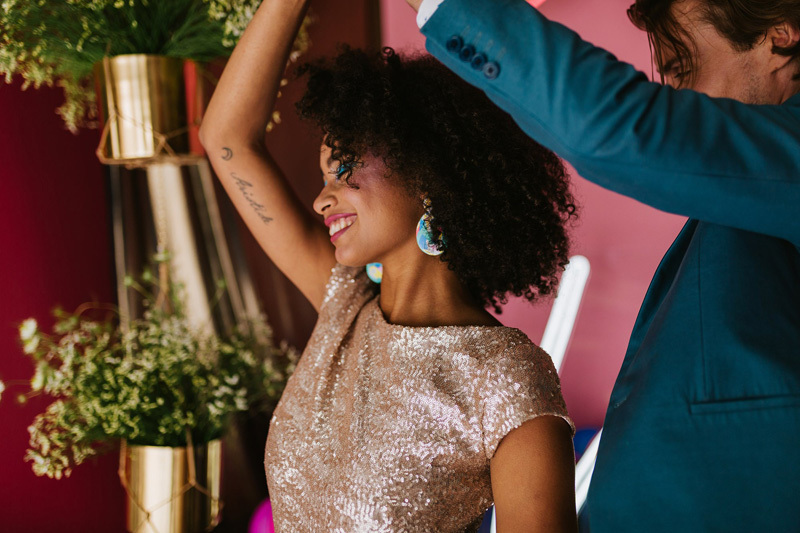 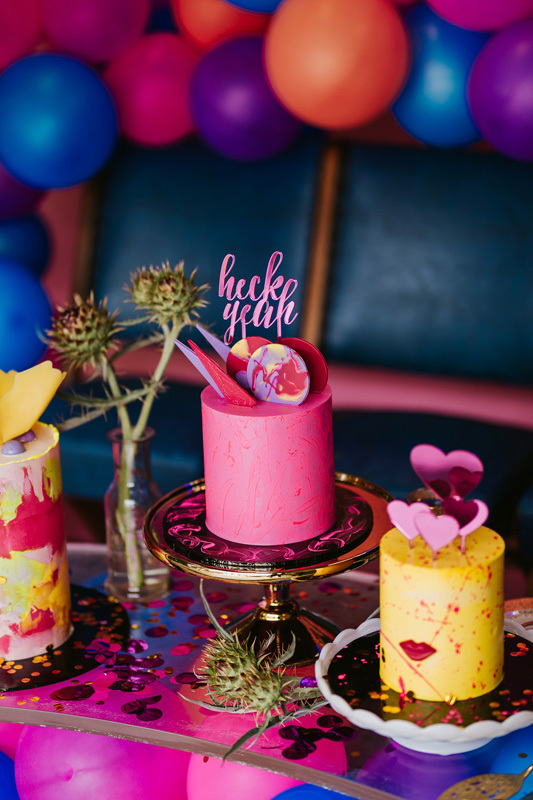 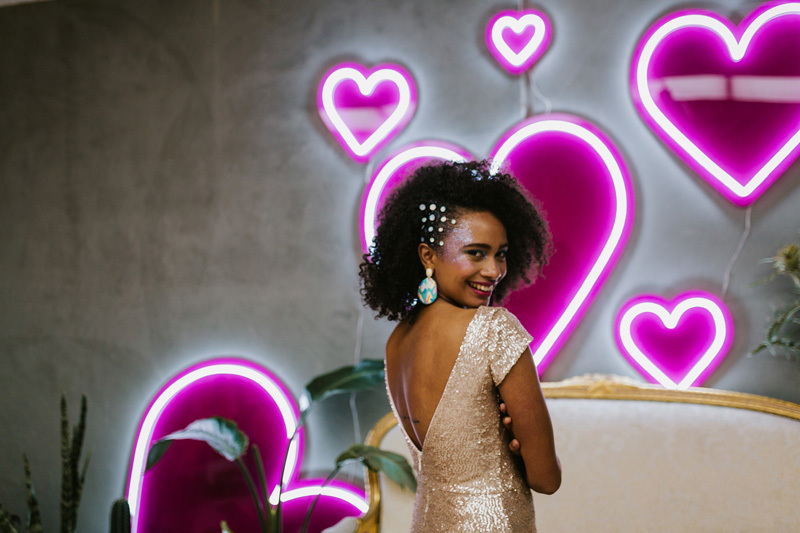 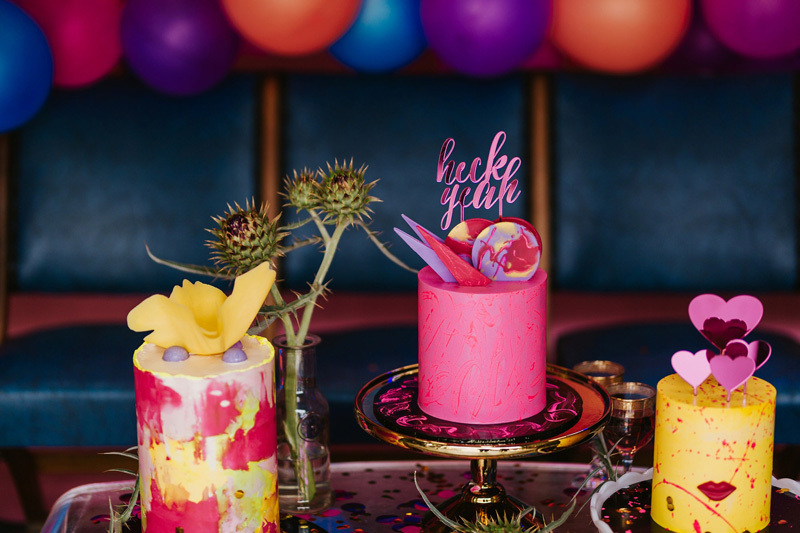 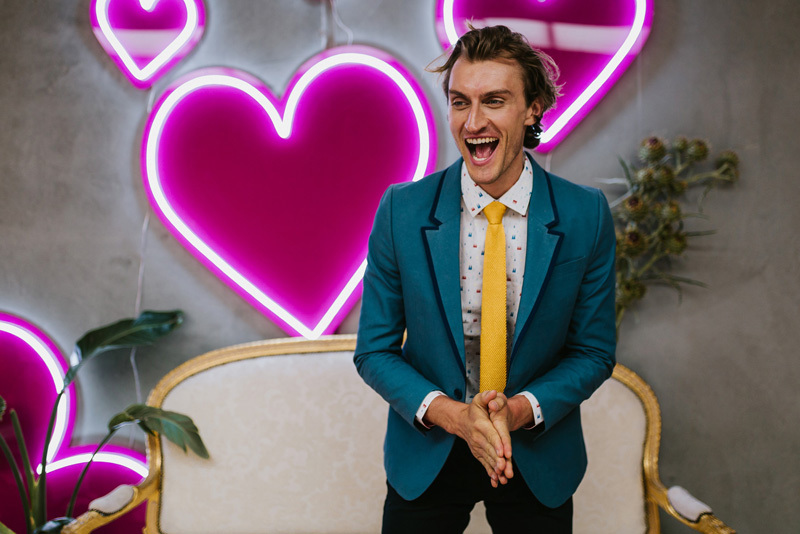 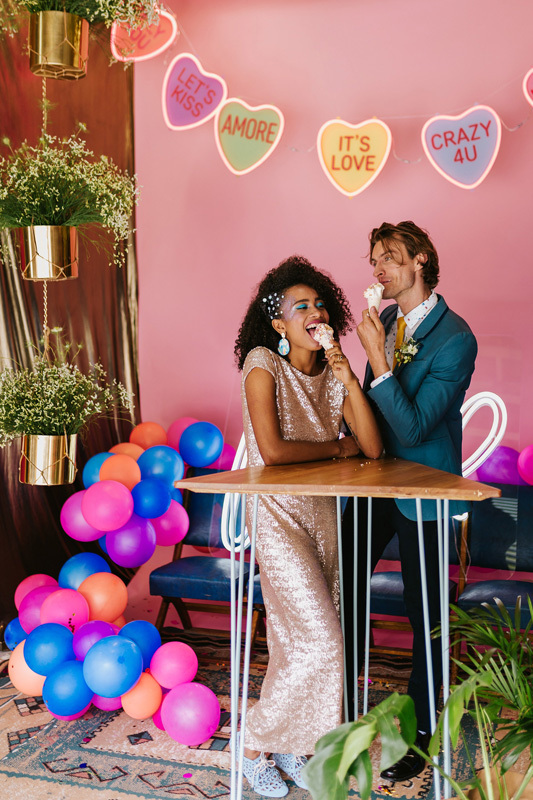 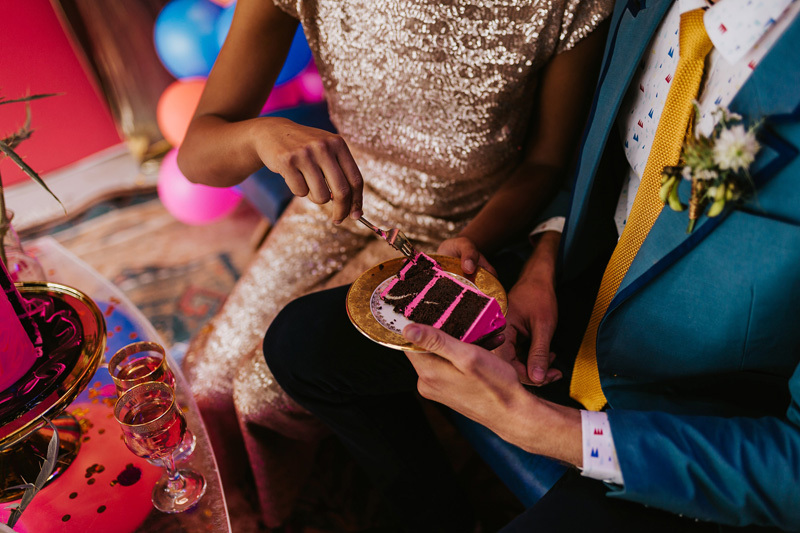 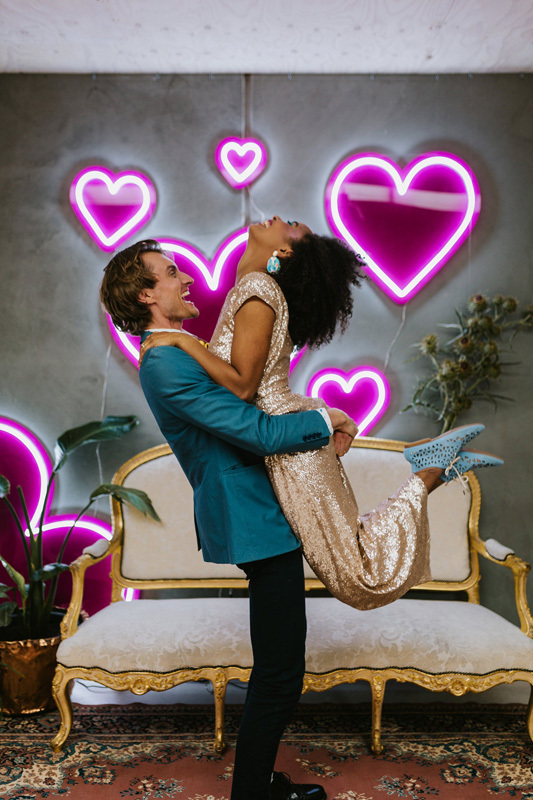 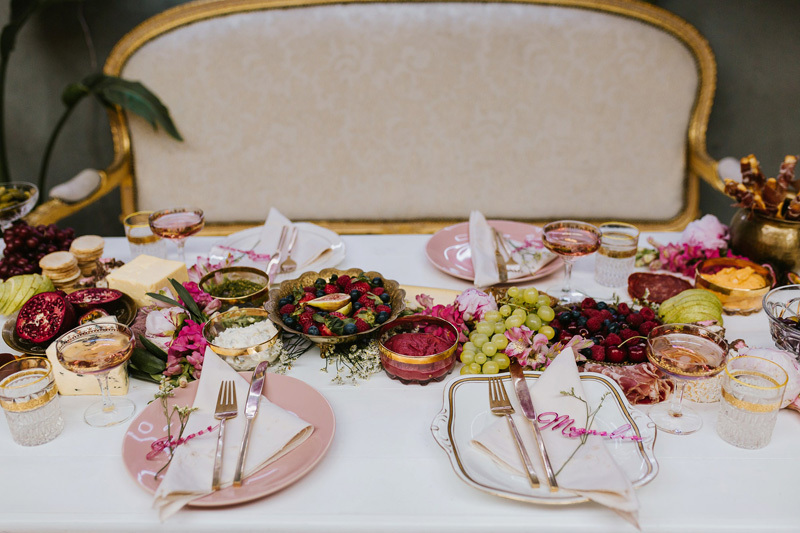 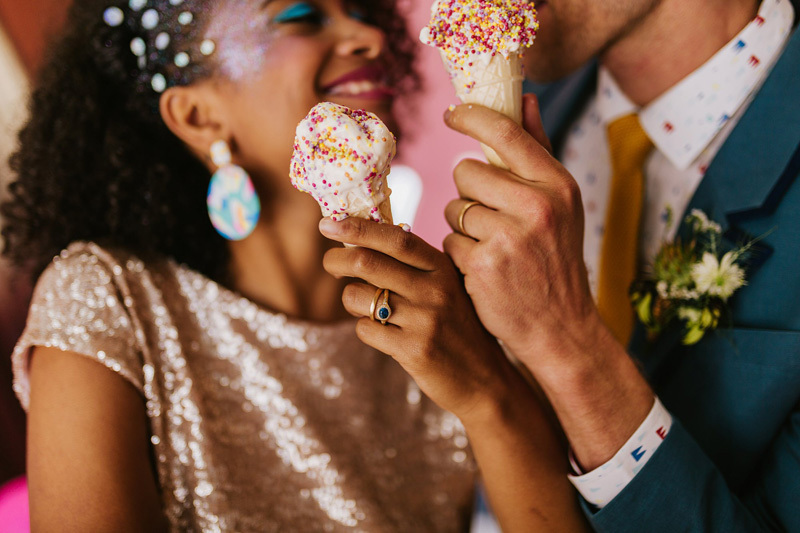 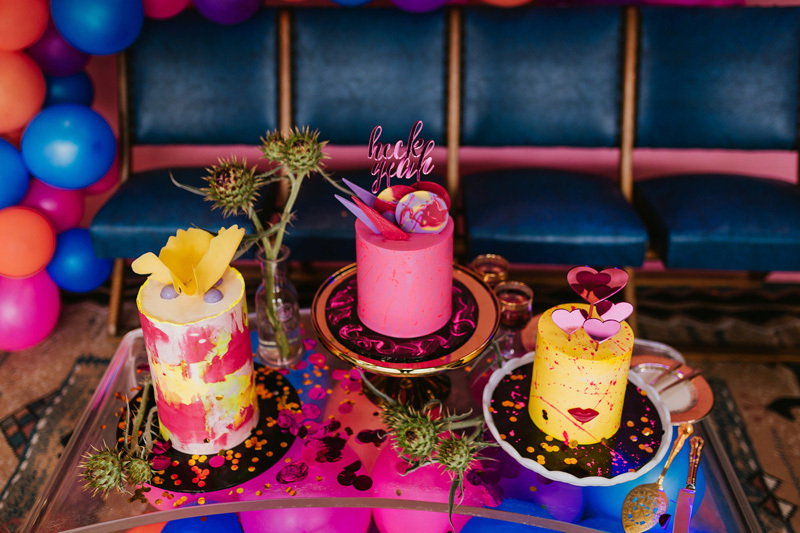 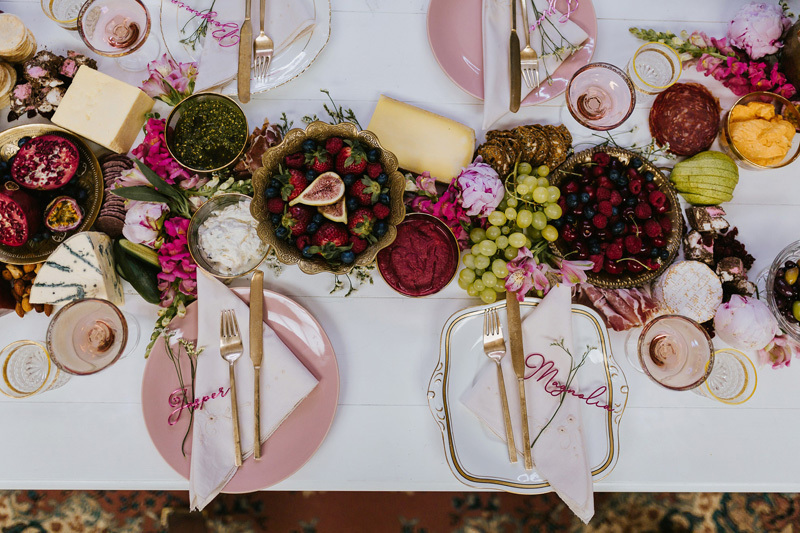 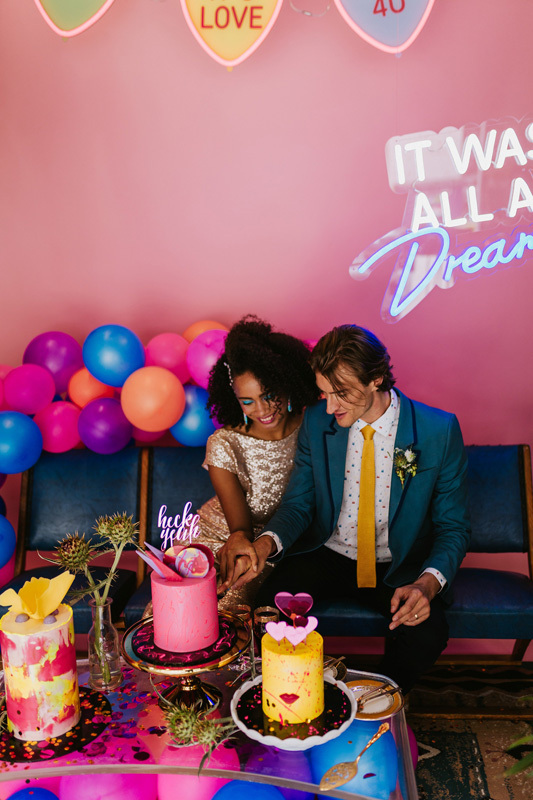 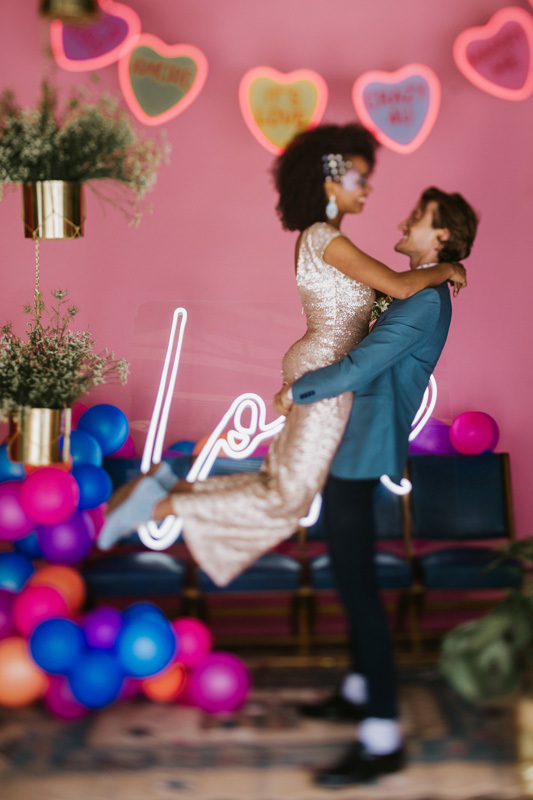 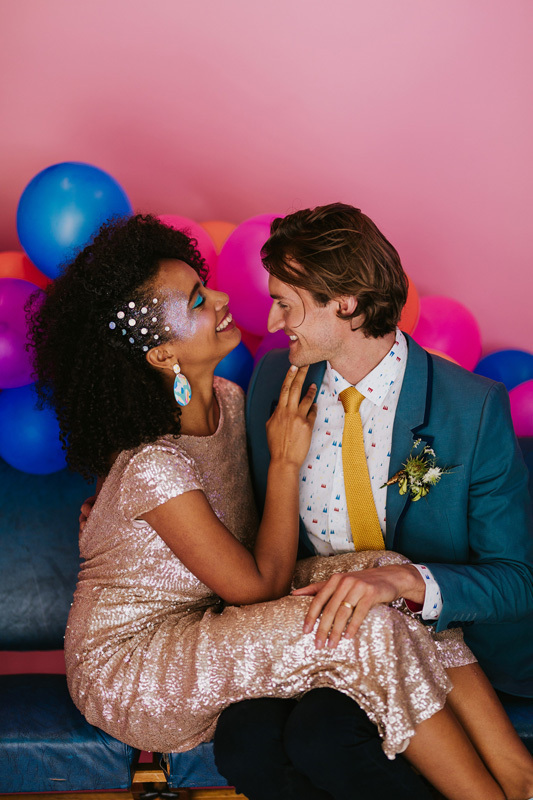 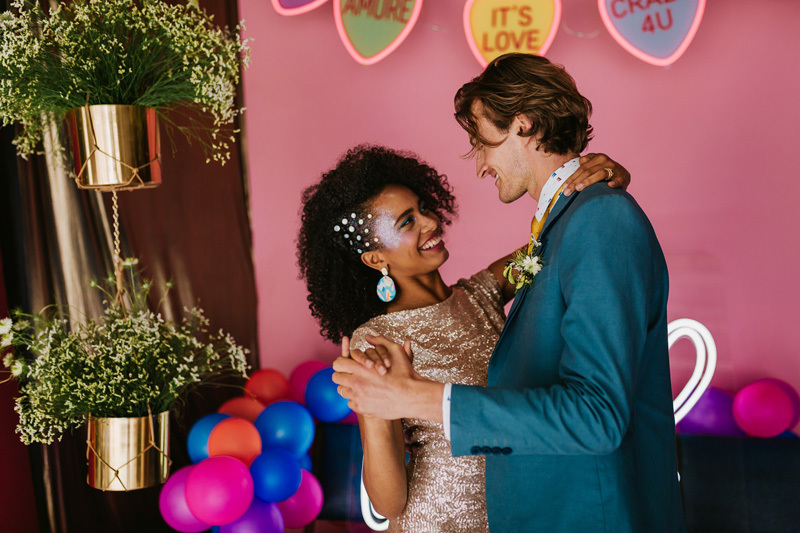 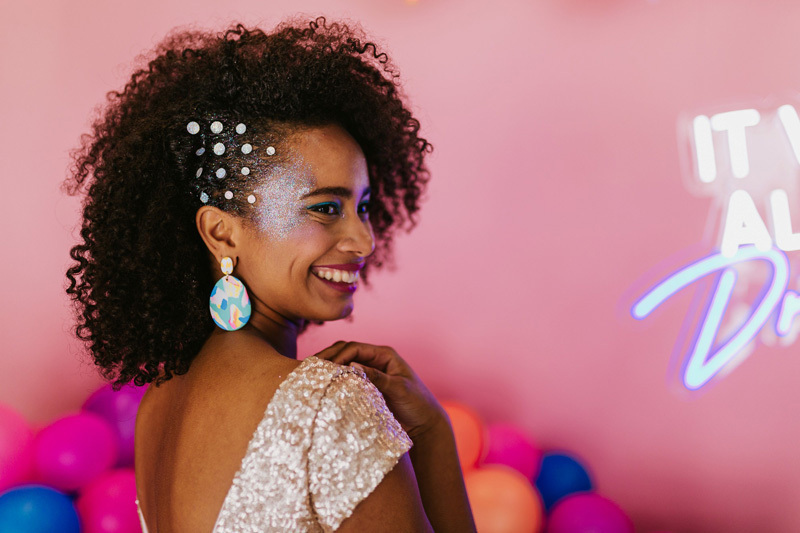 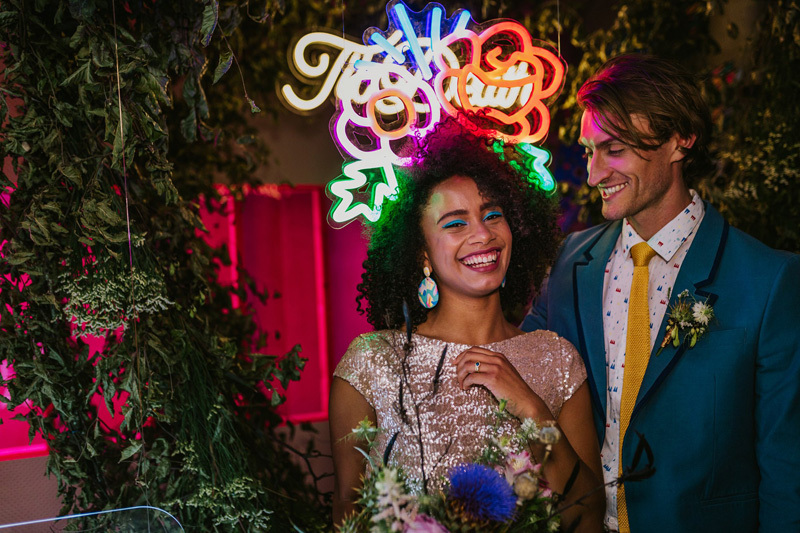 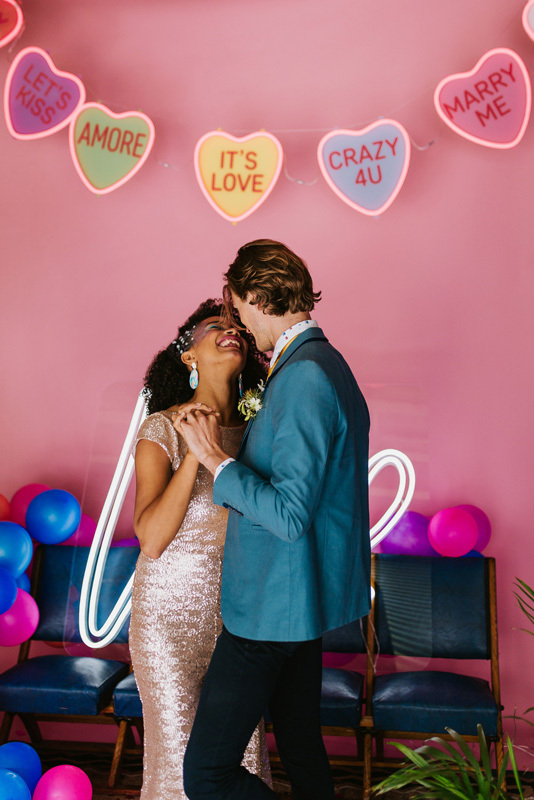 This styled shoot was created for untraditional couples who want to jazz up their weddings in totally daring ways – it’s bold, bright and deliriously happy! 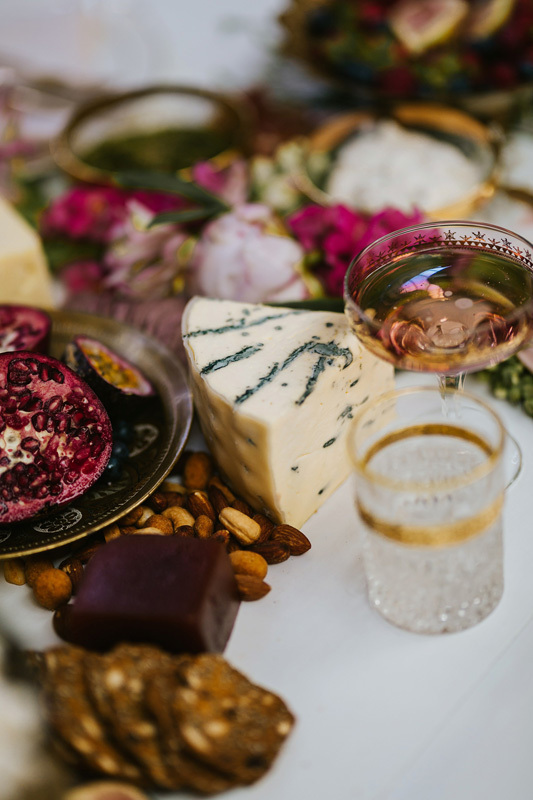 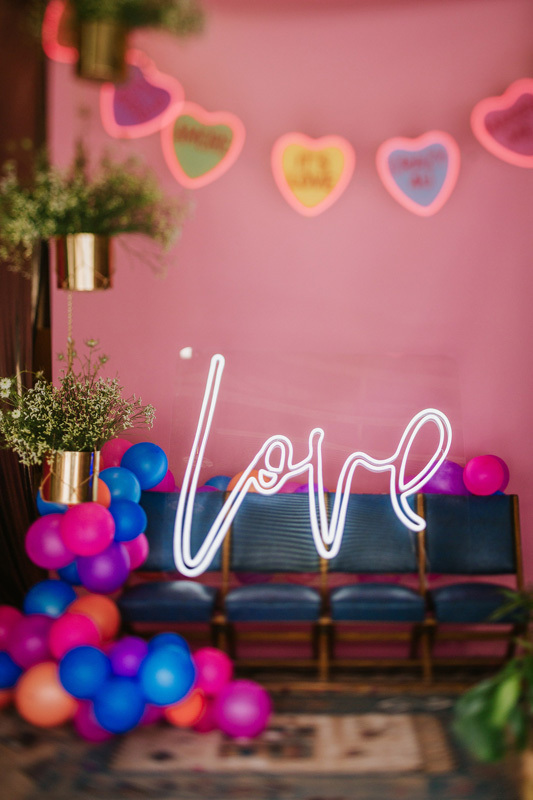 Kate Forsyth is the owner of Good Day Rentals – Melbourne vintage and retro furniture hire and event styling specialists. 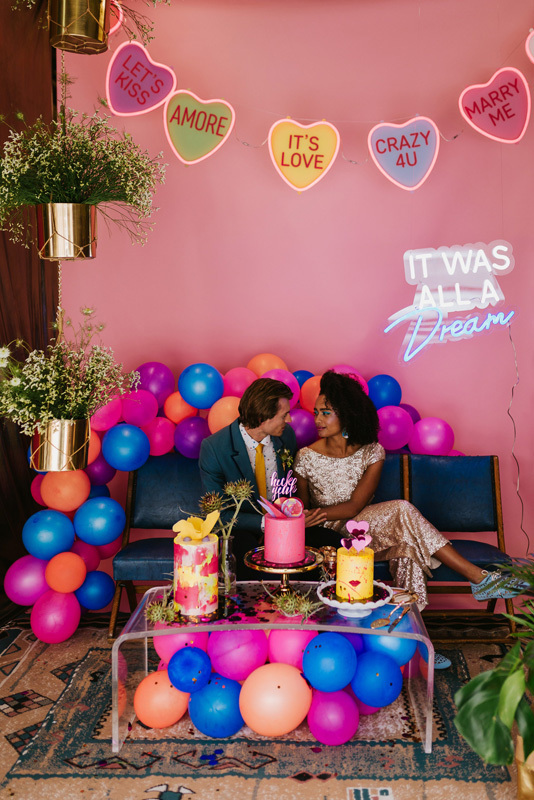 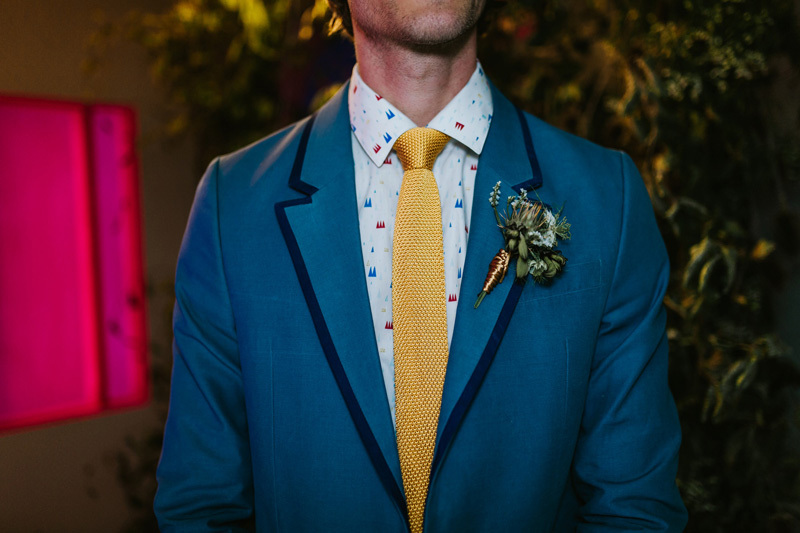 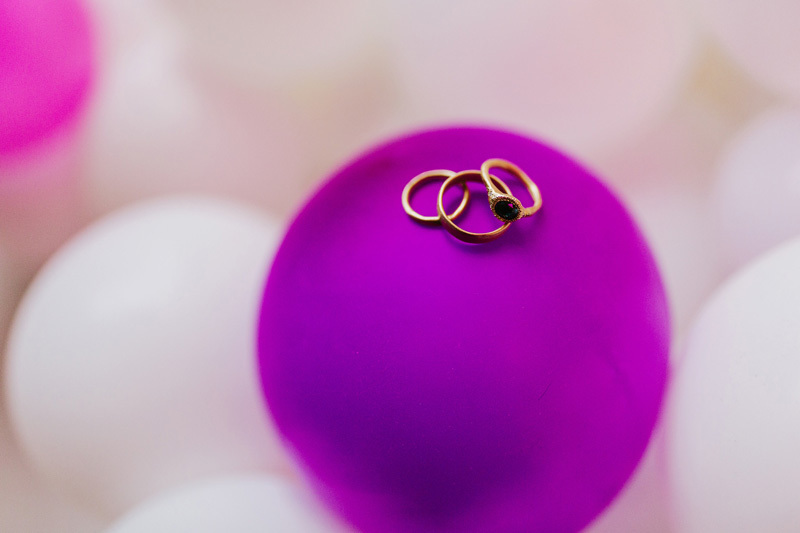 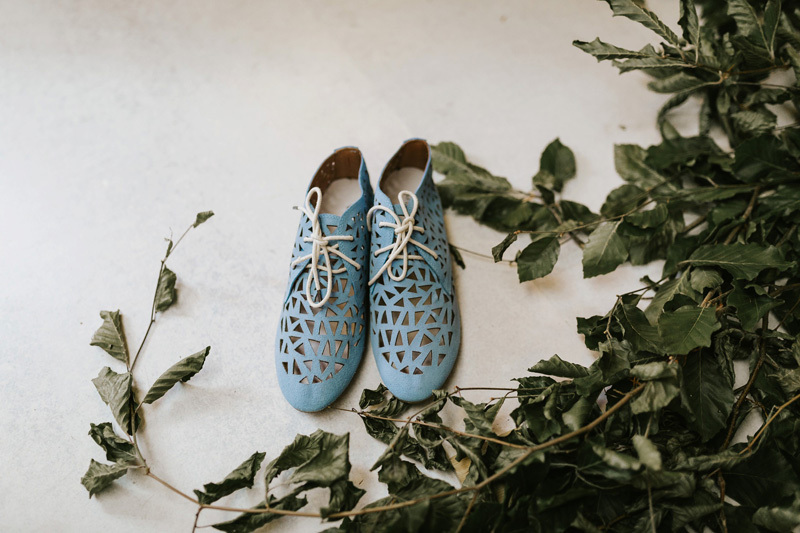 She teamed up with the raddest neon studio in town, Electric Confetti, to pull off this wedding extravaganza. 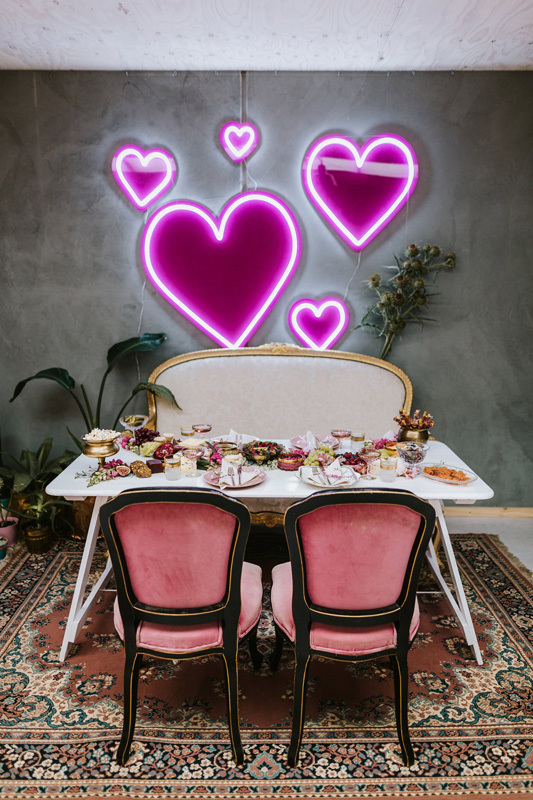 ‘I think we can all agree that neon lights and vintage furniture are a heavenly match,’ says Kate. 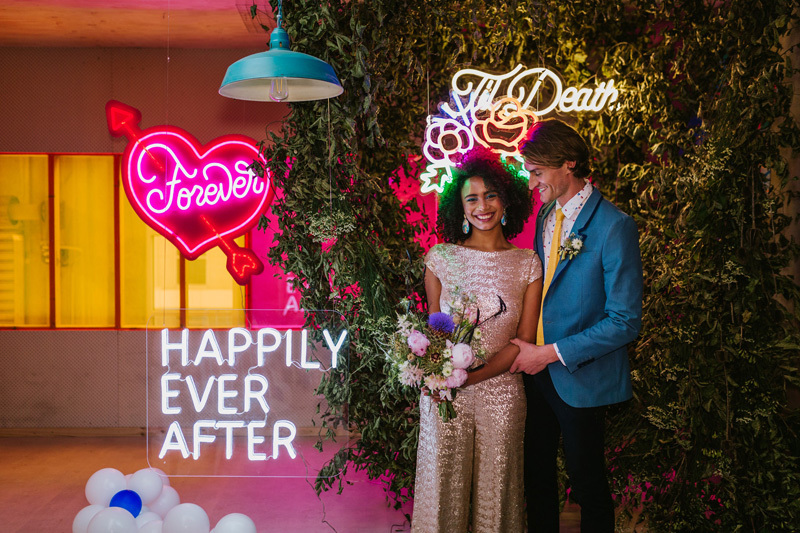 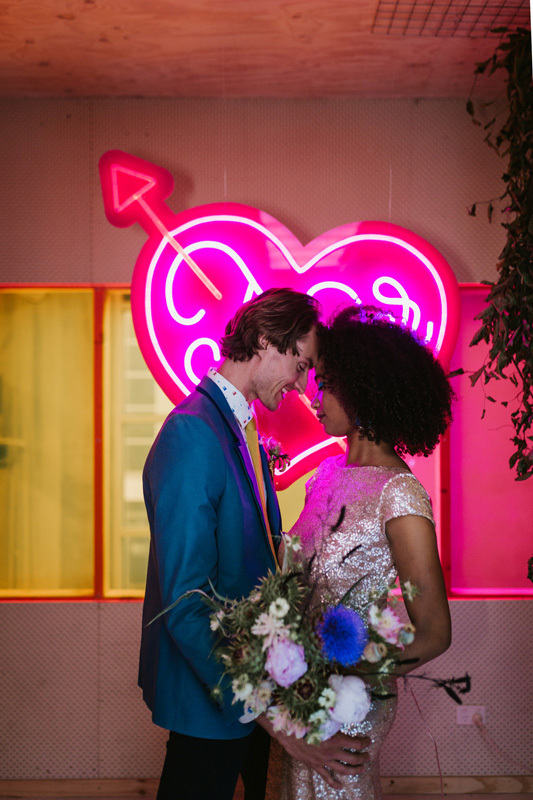 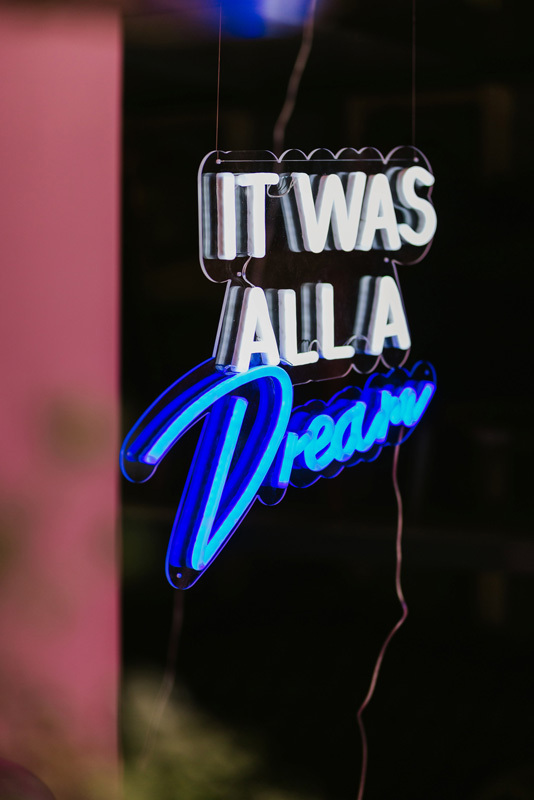 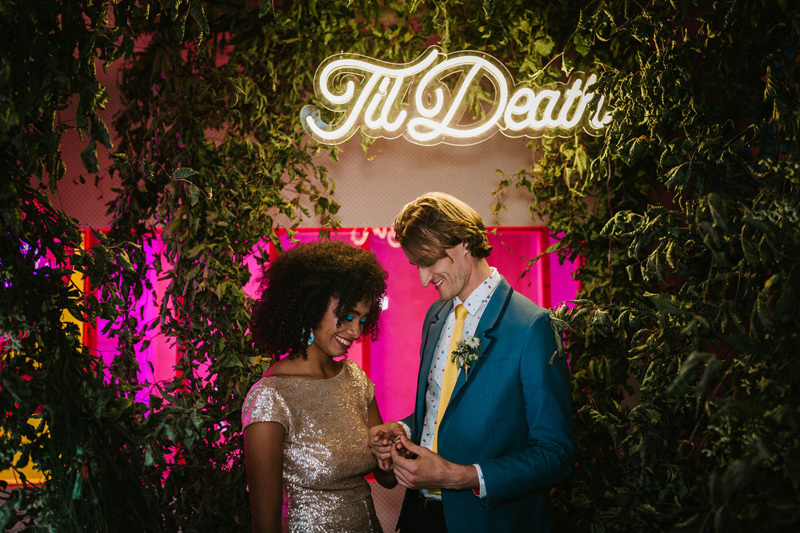 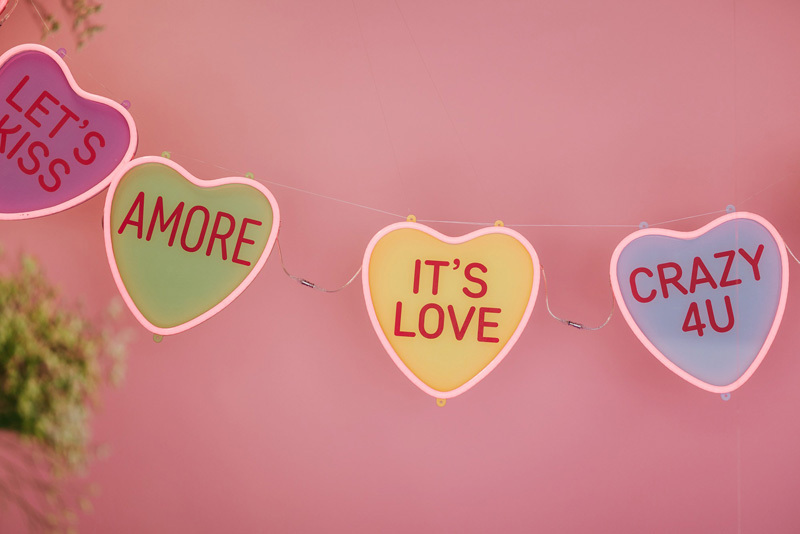 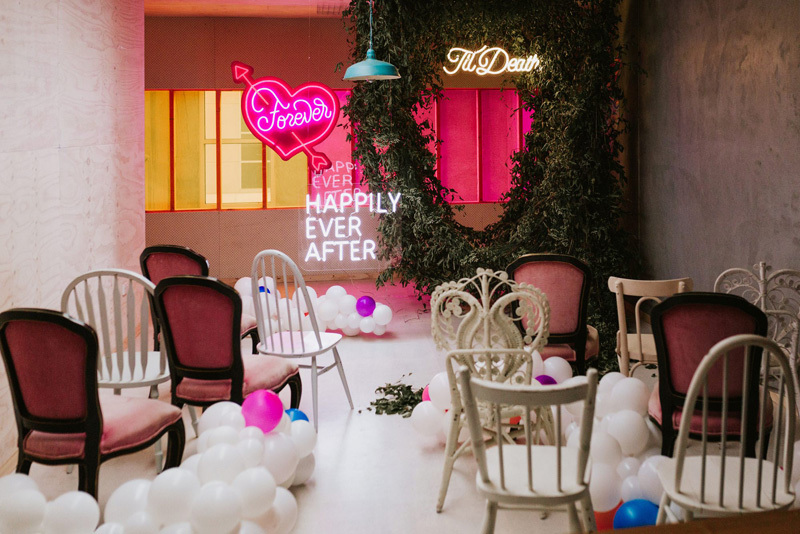 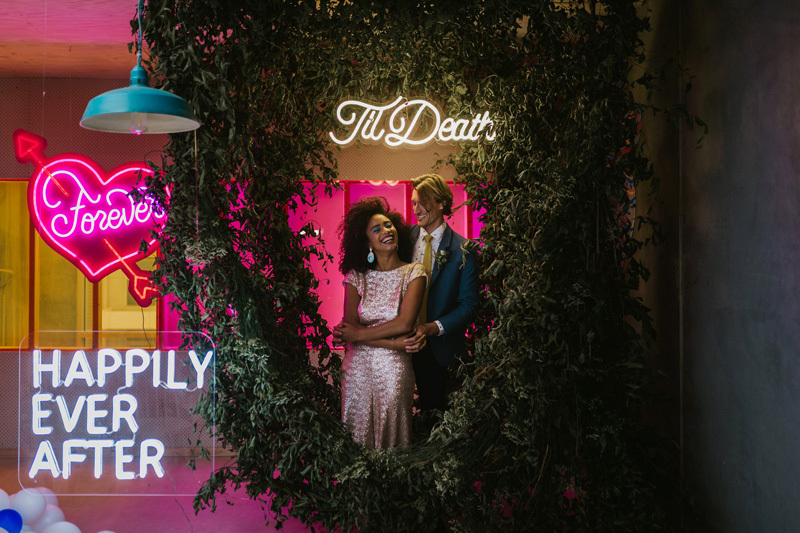 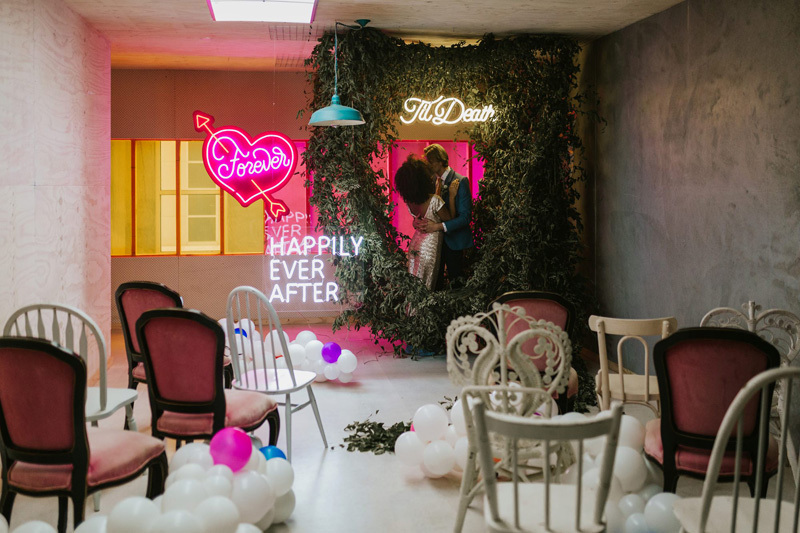 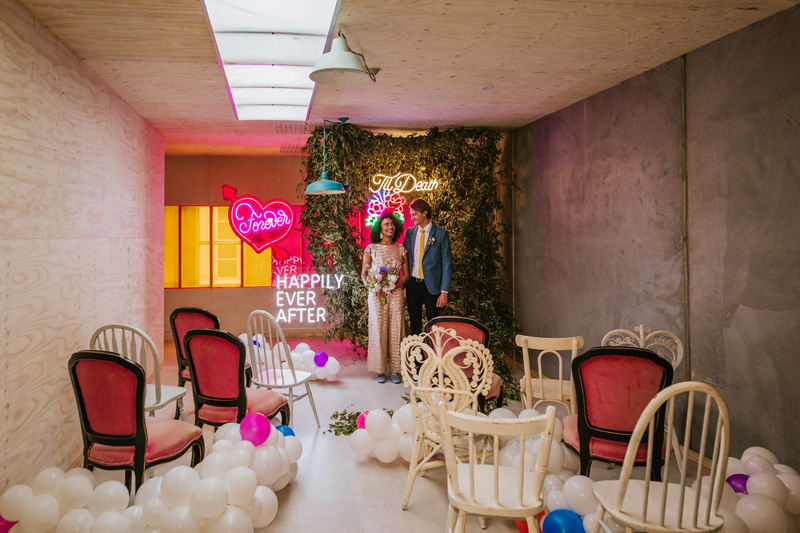 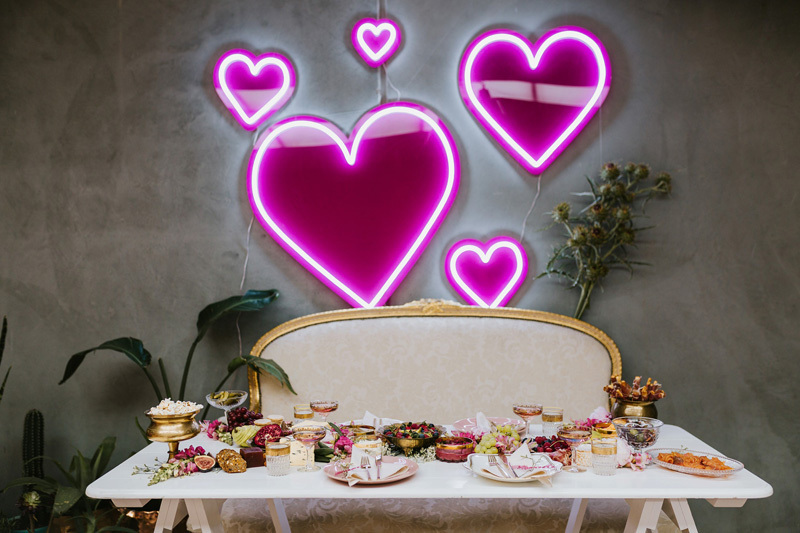 Electric Confetti’s wedding neon signs meshed perfectly with Good Day’s eclectic, mod-vintage concept, styling and furniture. 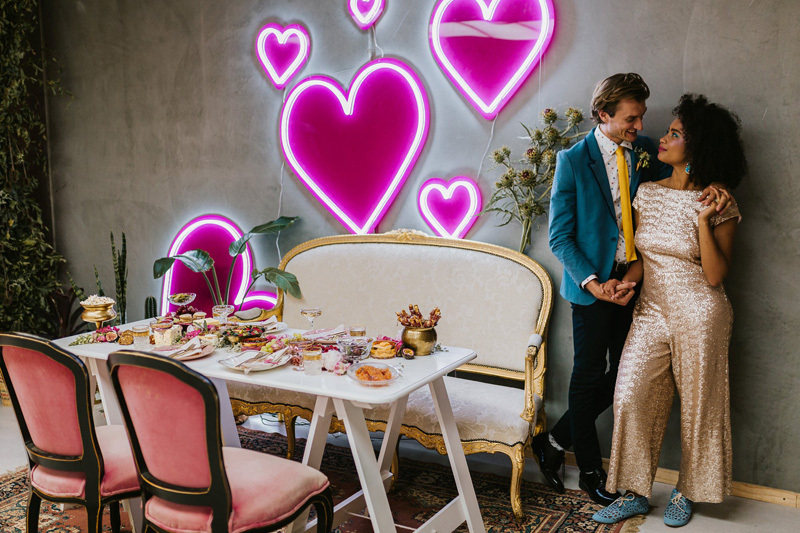 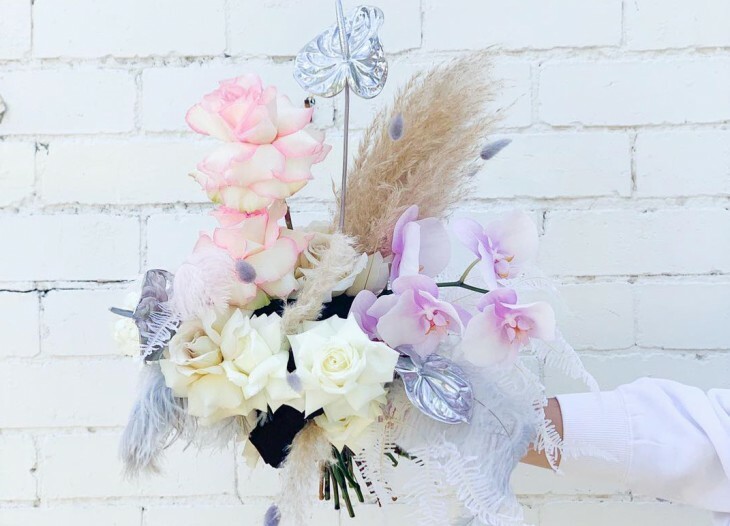 They also called upon the help of some amazing Melbourne wedding creatives to bring this shoot to live. 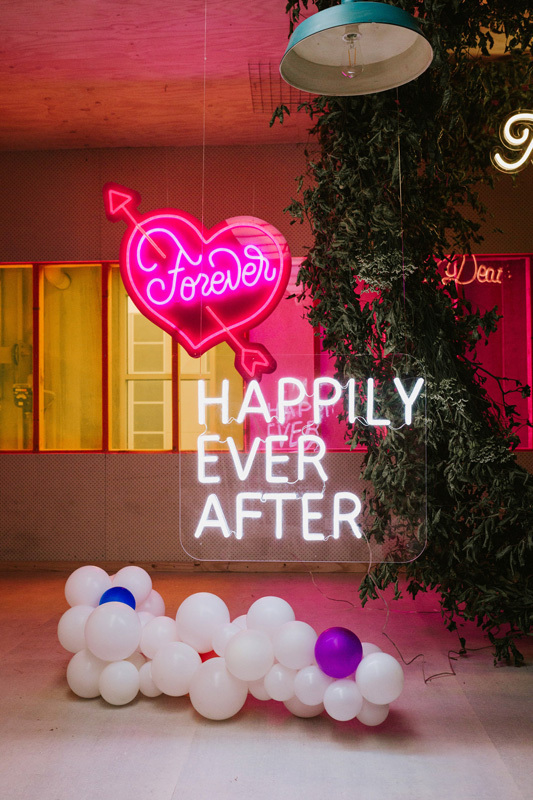 ‘The brief was to create a neon wonderland for a glittery punk Marie Antoinette, and that they did,’ says Kate. 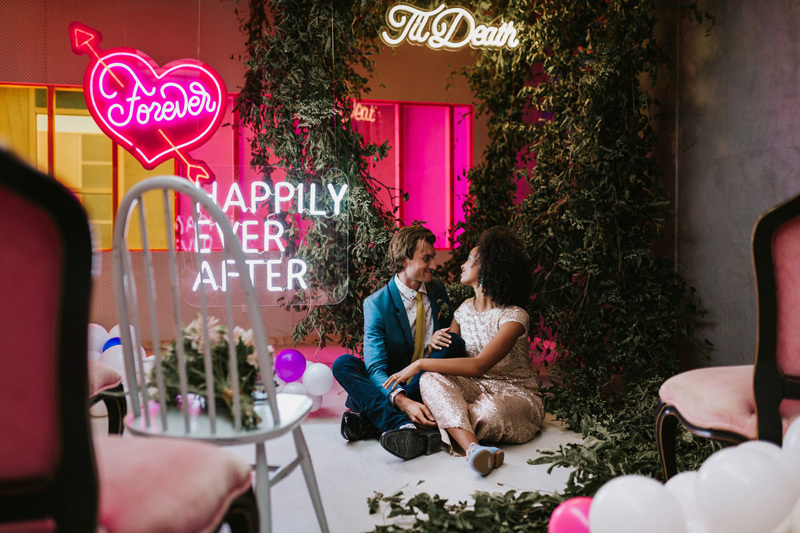 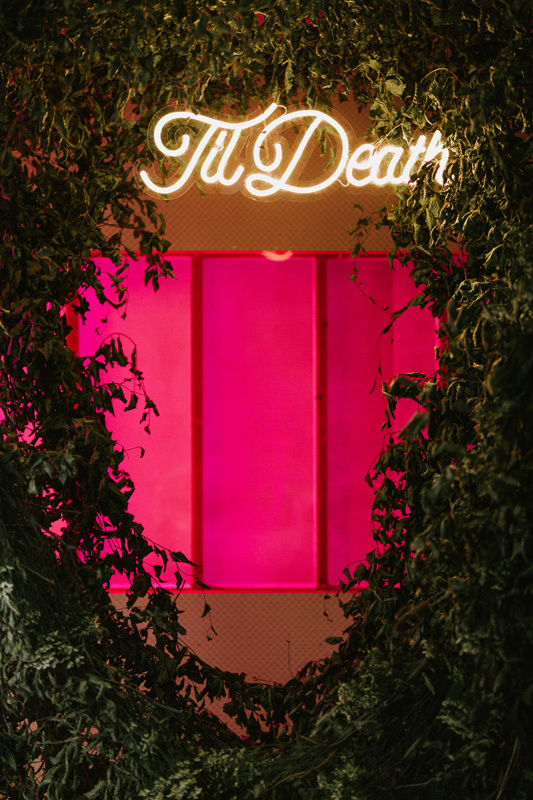 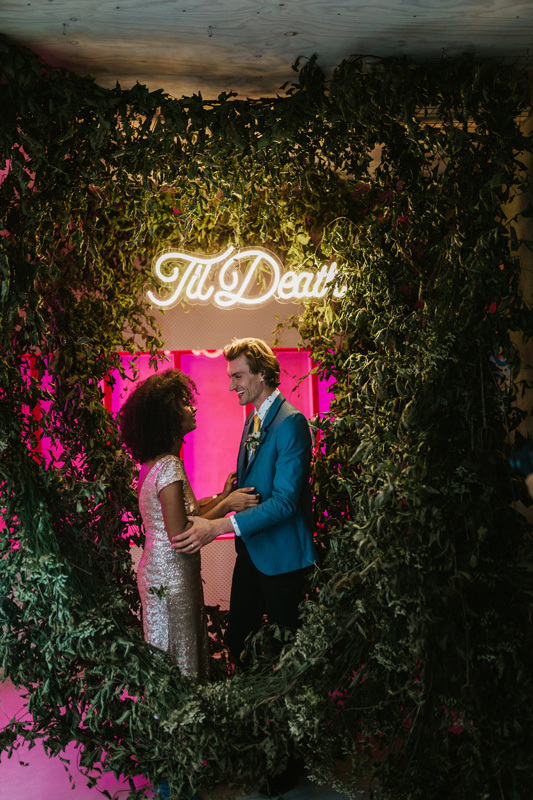 The giant vortex ceremony backdrop was made from both fresh and dried florals and was surrounded by about a dozen bright neon signs. 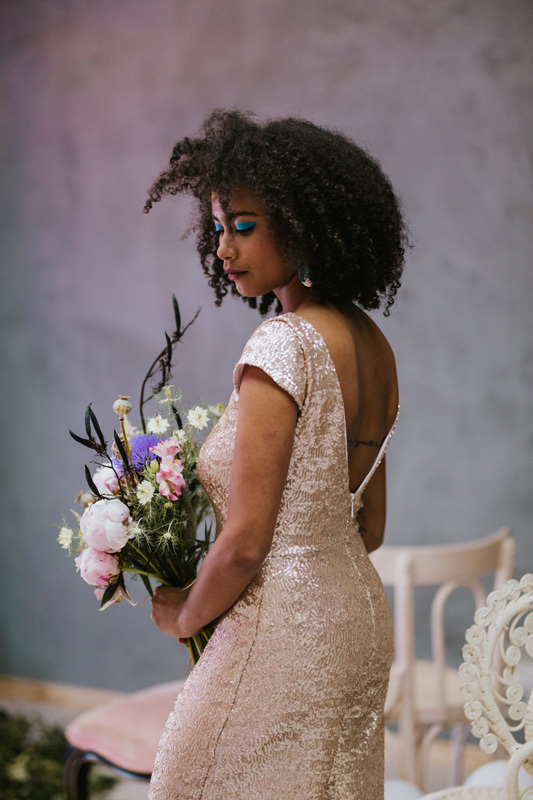 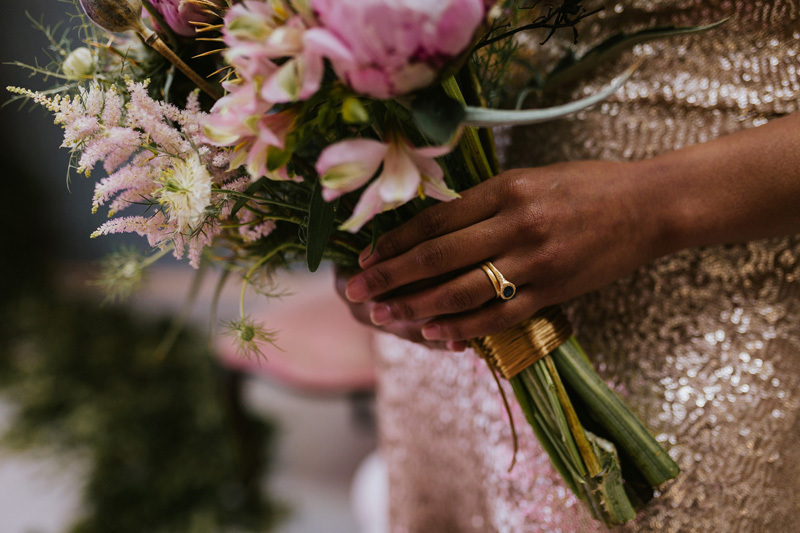 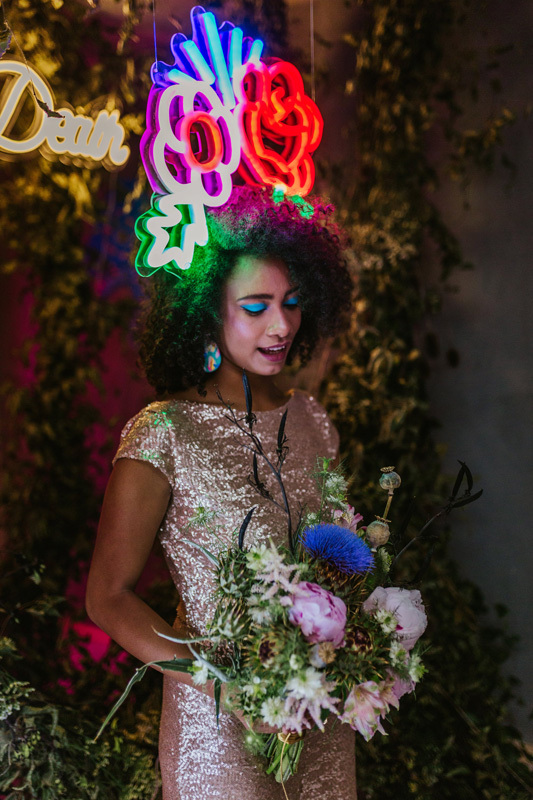 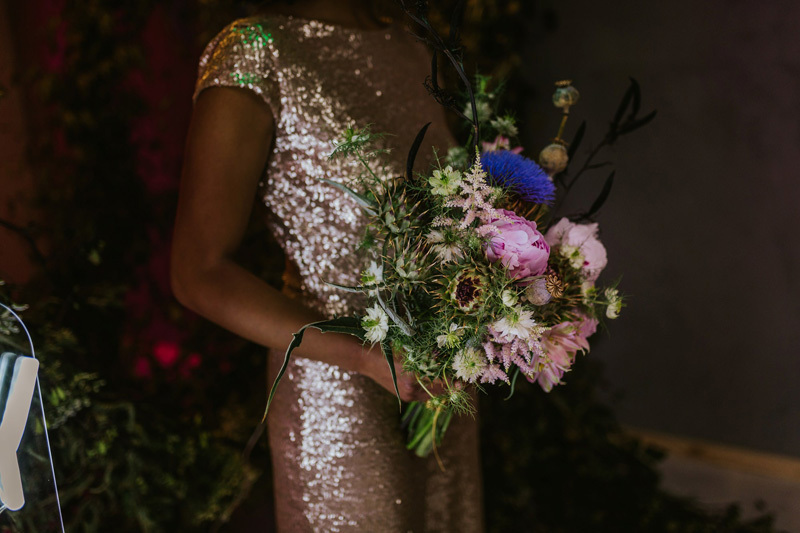 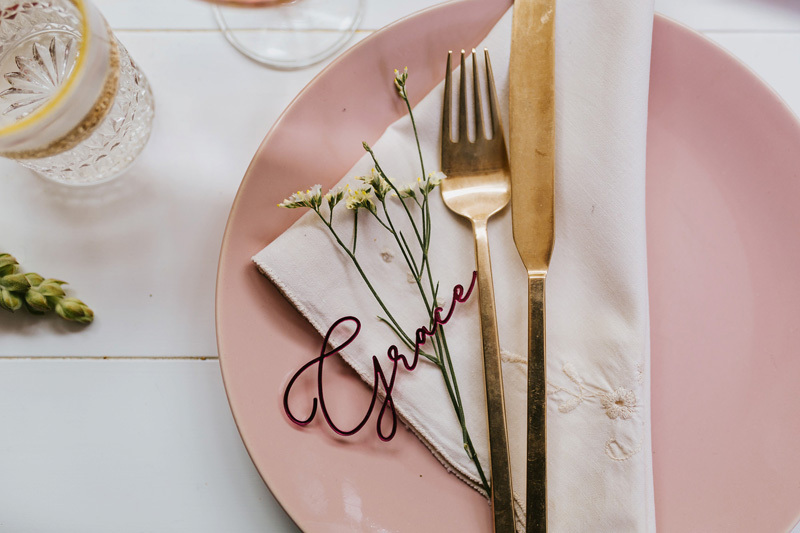 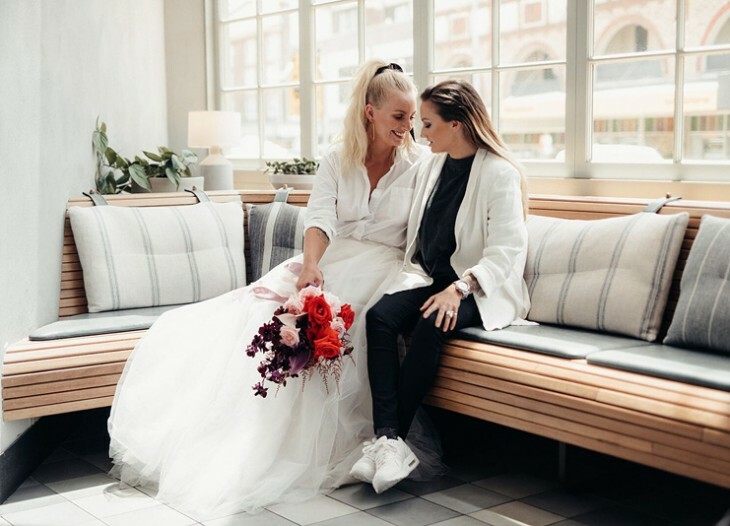 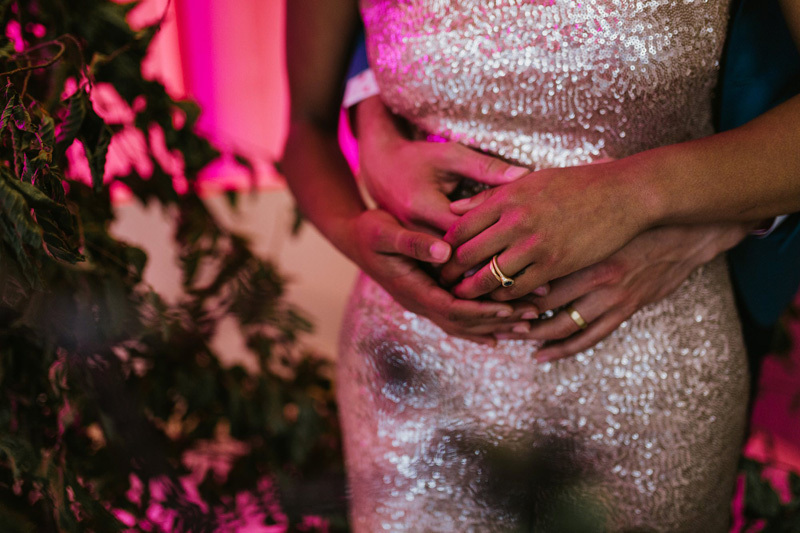 The bride was also adorned in a neon flower crown and dressed in a custom-design rose gold sequin jumpsuit made by up-and-coming bridal designers, Ginger & Gold. 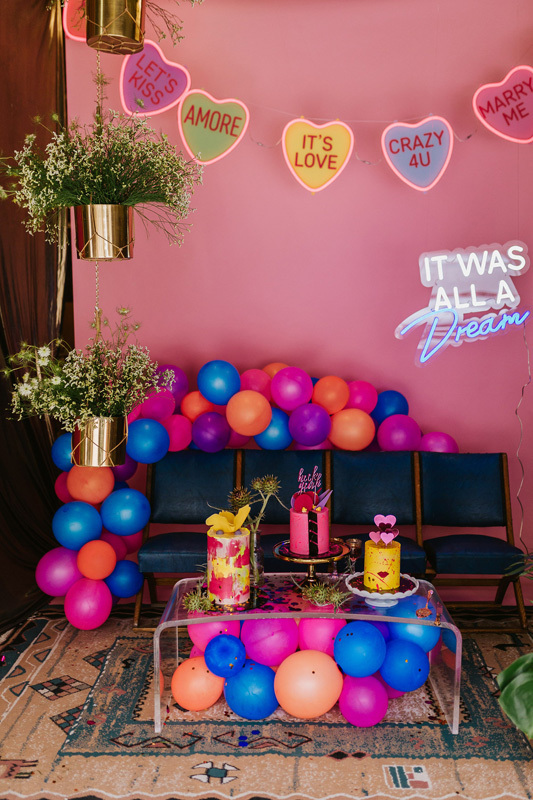 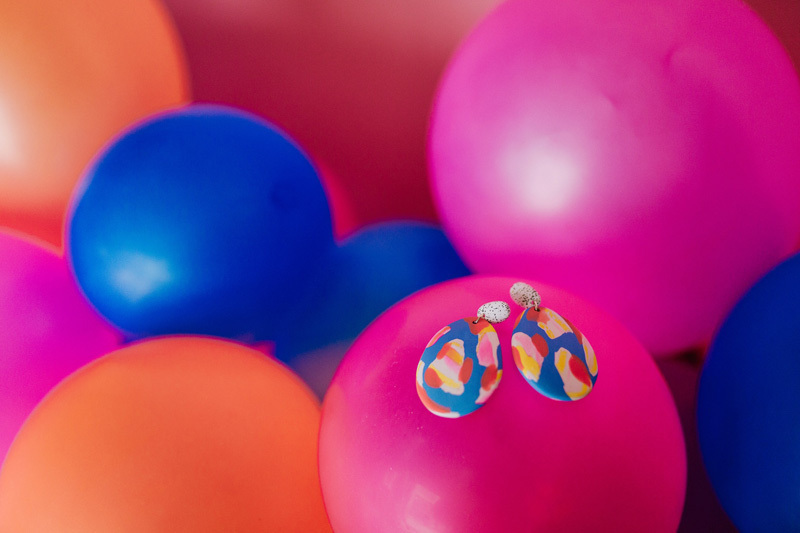 Balloons were scattered across the venue, with a balloon garland, a balloon table and balloon clouds in the ceremony. 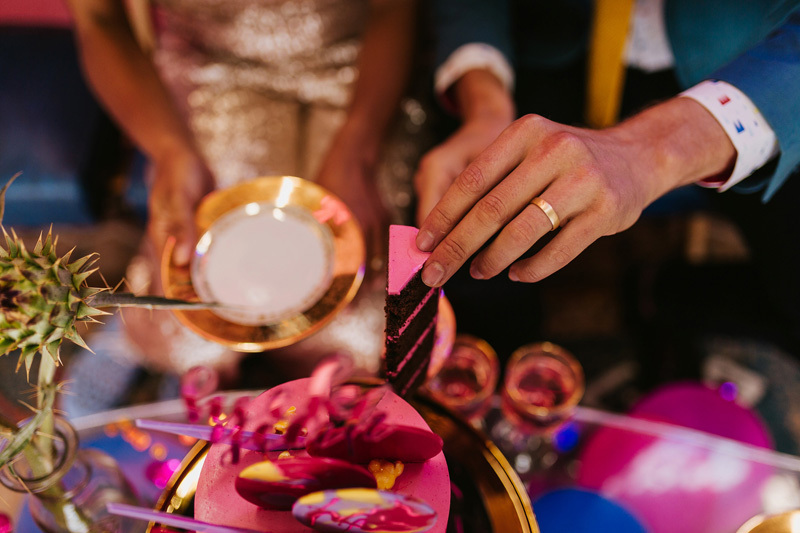 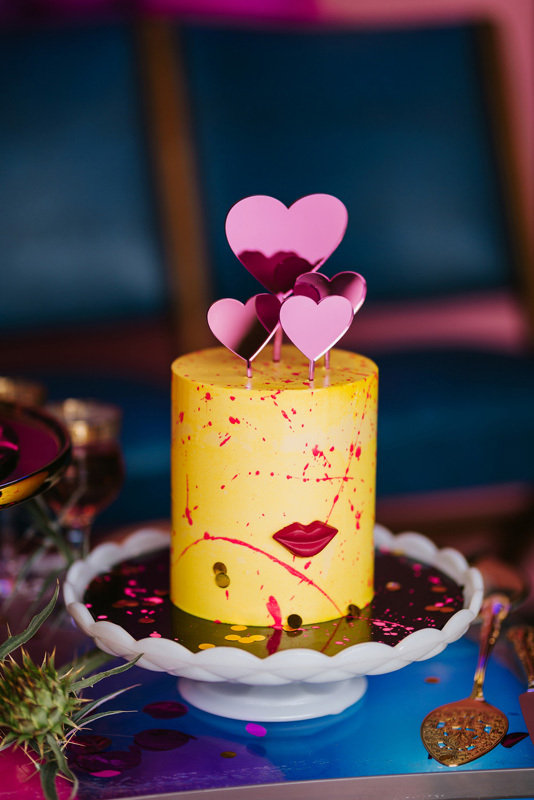 The dessert lounge was decorated with beautiful neon cakes from Don’t Tell Charles and the grazing table was fit for Marie Antionette herself. 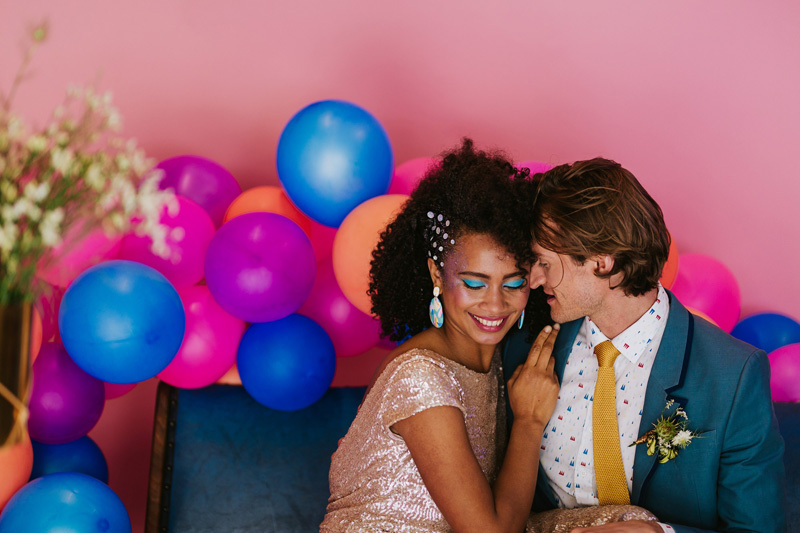 We can’t get enough of these crazy, colourful images. 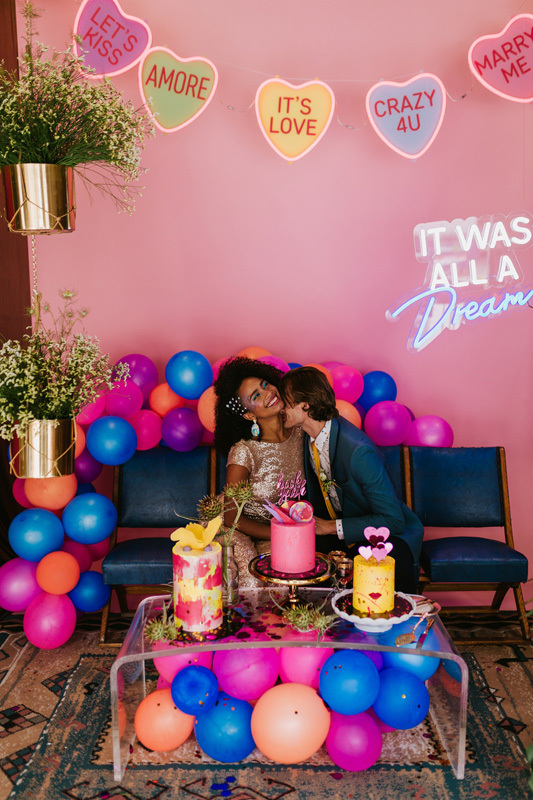 Get inspired to be bold in your wedding choices by perusing the images below!